This post is part of the series: Food and Mood. Today I’m welcoming Dr. Debbie Sorensen as a guest blogger. Every now and then I feel something that could perhaps be called “Not Enough Veggies Guilt.” It is the shameful emotion that arises when I realize that I haven’t eaten nearly enough vegetables for a while. 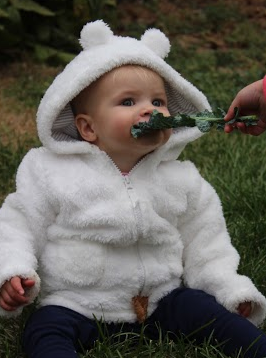 What better way to remedy that unpleasant feeling than to eat a big dose of super-healthy leafy greens, like kale? I am not one who generally loves the taste of kale. 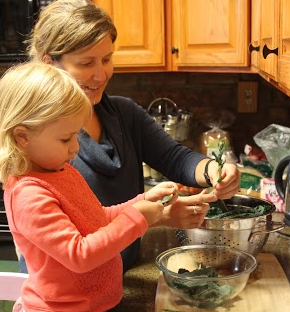 For me it has mostly been more of a “should eat” in my diet than a “want to eat.” That is, until my in-laws introduced me to this really yummy kale salad recipe. 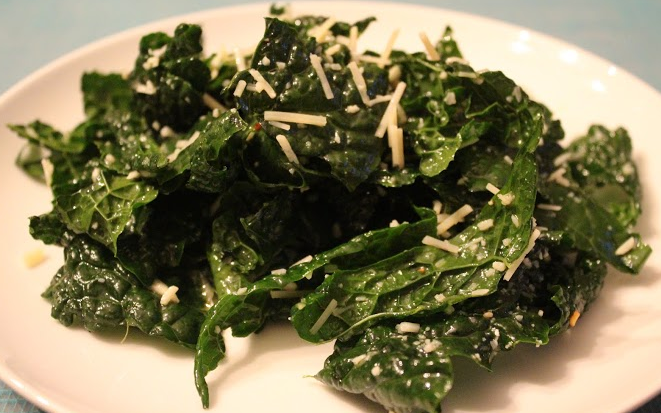 Although I don’t naturally love the taste of kale, I DO naturally love the strong flavors of garlic, lemon, and freshly grated Parmesan cheese. And a little zip from crushed red pepper makes those flavors all the better. When you marinate raw kale in a dressing made of those ingredients, it is transformed into something I can’t stop eating! And with all that nutritious kale in my body, my feelings change from guilty to virtuous, a much more pleasant state indeed! 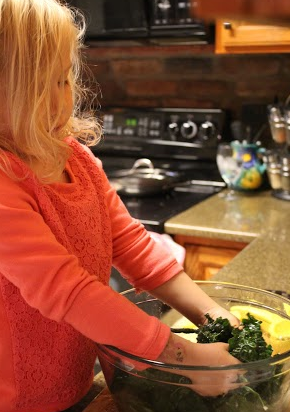 I can’t guarantee that all children will love this recipe, but you might be surprised. 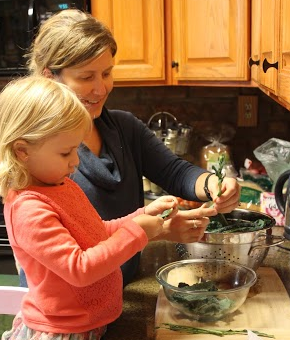 My kids have been known to nibble a little kale out of our garden, and will eat some of this salad. 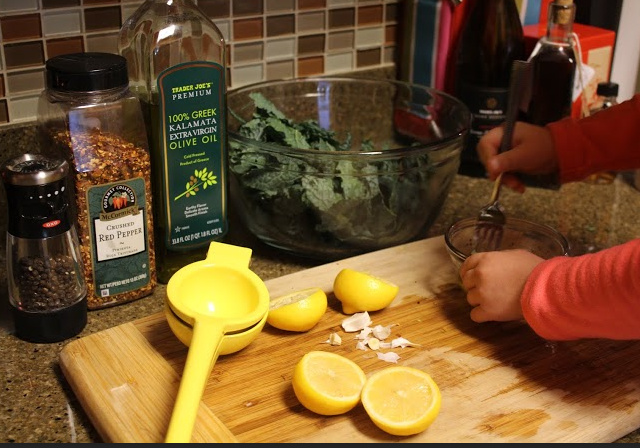 And, it is a fun recipe for kids to help make- especially tearing the kale into little pieces and massaging the dressing into the kale. 1. I don’t bother with the breadcrumbs, and the recipe is great without it. 2. I don’t really measure the ingredients for the dressing. I just sort of wing it, and I usually go heavy on the garlic and crushed red pepper. 1. Wash about 4-6 loosely packed cups kale. 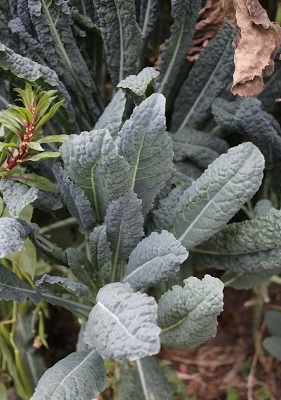 We grow Dinosaur Kale in our garden and it works well, but any kind of kale will be fine. 2. Remove thick stems, and tear into small pieces. Even small hands can help with this task! 3. 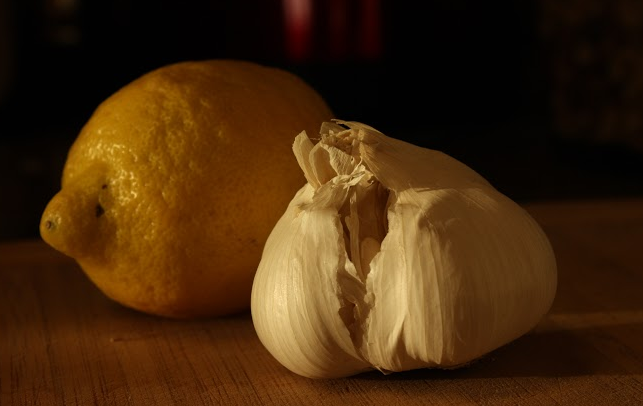 In a small bowl, combine: juice of 1 lemon, about 3-4 tablespoons extra-virgin olive oil, 1 or 2 cloves garlic (mashed or minced), salt & pepper (to taste), and crushed red pepper flakes (to taste). 4. 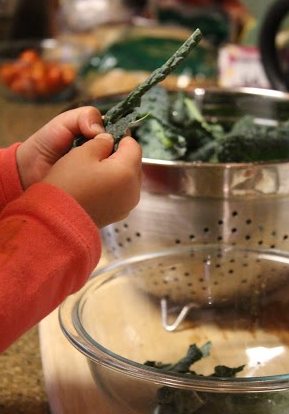 Pour over kale in serving bowl and use your hands to massage dressing into kale. Another great job for small hands. 5. Add about 1/3 cup grated fresh Parmesan cheese and mix into kale salad. 6. Let sit for at least 5 minutes and then it’s ready to eat. 7. Top each serving with a little more grated Parmesan cheese. Enjoy, and savor that virtuous feeling while it lasts! About the author: Debbie Sorensen is a a psychologist who lives in Denver with her husband and two young daughters. 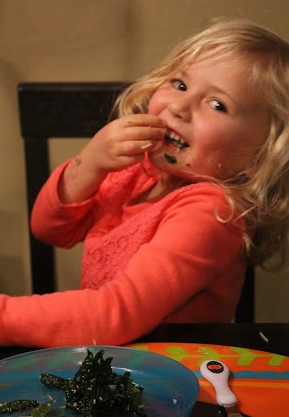 She tries to eat a healthy home-cooked dinner with her family most nights, but isn’t always successful.